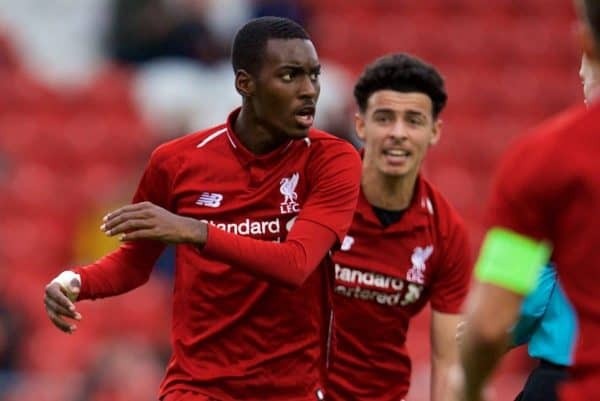 After rejecting the advances of Sporting CP, Liverpool are poised to take advantage of an unassuming rise to prominence for Rafa Camacho in 2019. Camacho looked set to rejoin his former club this winter in a possible 18-month loan deal, with further speculation over a possible permanent move back to his hometown of Lisbon. But after making his debut in the Reds’ 2-1 defeat to Wolves in the FA Cup third round, Jurgen Klopp made the decision to veto any exit for the 18-year-old. This was not simply to allow him to further his progress in the academy, and in first-team training, but more so as a genuine option for the senior squad this year. Before this came two big decisions from the manager: firstly, to keep Harry Wilson at Derby; and secondly, to sanction Nathaniel Clyne and Dom Solanke’s departure to Bournemouth. With no plans to add to his squad in the January transfer window, Klopp is set to push forward despite a spate of defensive injuries and a possible lack of depth in the final third. It is certainly in the realms of possibility that this is informed by the progress made by Camacho in 2018. After a rocky initial spell in England with Man City, in which he was deemed not good enough for a professional contract before he left in 2016, Camacho took time to settle at Liverpool. 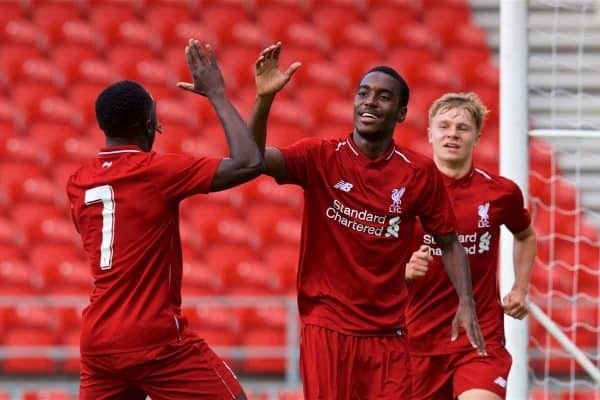 He certainly wasn’t one of the figureheads of the academy sides in his first season, but he wasn’t expected to be, with the Reds taking a patient approach with his progress. 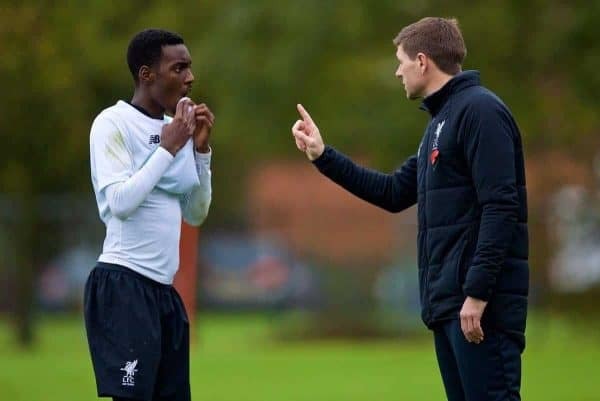 Instead, he grew in importance under Steven Gerrard last term, as a regular for his U18s side, and after making his first steps at the club as a wide forward he was required to switch duties under the legendary midfielder. Gerrard utilised him as a wing-back in a 3-4-3 formation, which can be identified as a major touchstone in Camacho’s development, ironing out his natural, one-dimensional approach in attack and allowing him to refine his defensive game. Soon, Camacho was leading the charge going forward, but also tracking back with the diligence that saw him deployed as a right-back by Klopp in pre-season—and later in his debut at Wolves. 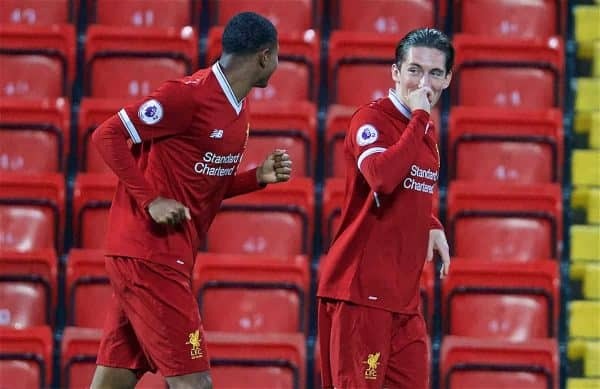 He has gone from being a reasonable comparison with Ryan Kent to a more well-rounded young player, whose confidence has risen significantly as he takes up a senior role with both the U19s and U23s, despite not turning 19 until May. Camacho has showcased his versatility throughout the season so far: as a full-back for the first team and a winger for the academy sides, while most recently in the U23s’ 1-1 draw with Brighton, he partnered Liam Millar in a new role up front. “Rafa is very intelligent. He gives centre-halves problems by coming off the front and finds pockets of space to turn and link the play,” coach Neil Critchley told the Liverpool Echo, after the Portuguese’s goalscoring display at Kirkby. “He’s always dangerous when he gets running at people. He was a real handful all night. The notion of “resetting the press” is an interesting one, as it acknowledges Camacho’s understanding of the system worked throughout the age groups at Liverpool, with the emphasis on a swift transition from defence to attack. This has no doubt been polished under Klopp at Melwood, but the roots were already set under Gerrard, and this is likely to be a key reason why he is so favoured by the first-team manager. 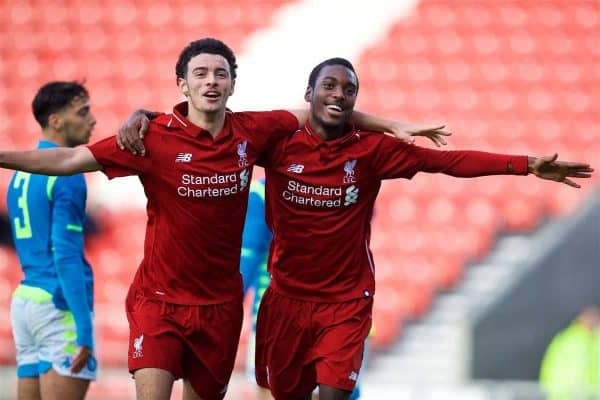 However, it is so often stressed at academy level that, regardless of the close ties between Kirkby and Melwood, a young attacker’s tangible output is paramount. Therefore, it is crucial to note that Camacho is producing at a similar level to Wilson in the first half of last season—the Welshman’s most recent, and likely last, regular run with the U23s. In 16 games, Wilson scored 12 goals and laid on 10 assists, primarily operating from the flanks; in 18 games from August to the start of January, Camacho has scored nine and assisted 12. Of course, it is salient to note that the former’s contributions came solely with the U23s, but it is also worth acknowledging that Camacho is two years younger than Wilson was this time last year. Only Matty Virtue (six) has outscored Camacho (five) for the U23s, while the teenager is top goalscorer for the U19s, with four. The only academy players to outscore him in all competitions are prolific U18s strikers Bobby Duncan (19) and Paul Glatzel (17), but his all-round game—both on and off the ball—is significantly better at this stage. While the example of Wilson is a murky one given he is yet to add to his sole appearance for the first team since debuting in 2017, Klopp has mentioned his desire to include him on his return from Derby this summer. And Camacho, who remarkably became the first academy product to debut for Liverpool since Wilson, two years on at Molineux, arguably has an even better chance already. For now, Camacho’s versatility has clearly given him the advantage over fellow breakthrough act Curtis Jones, and such is Klopp’s faith—plus a plethora of other options including James Milner and Fabinho—he saw fit to grant Clyne’s loan and deny one for the No. 64. His immediate future will likely come as an emergency right-back, though the manager will be aware that he could fill in for the likes of Sadio Mane and Mohamed Salah as a last resort too. Early exits from the FA Cup and League Cup will likely restrict his starting opportunities this season, but the call to reject a clearly beneficial temporary switch to Sporting suggests Klopp has a plan for Camacho in 2019. But by the same token, it would be unwise to bet against further appearances for Camacho between now and the end of May.